"Good pruning is the art of taking away, like a sculptor chiseling a rock, working to uncover life inside......you work with the past and see the future, adding to a living timeline"
"I don't get paid for what I take off"
At Westbrook Wine Farm, we literally "make" our wine in the vineyard. 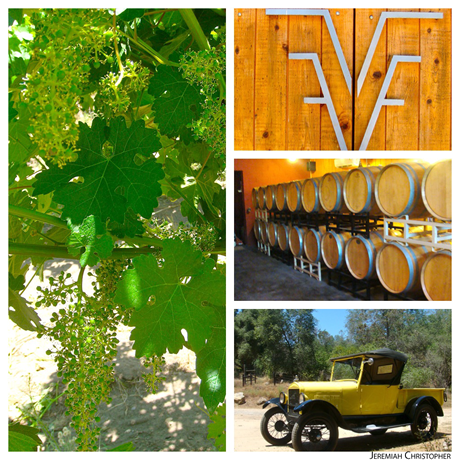 In our Fait Accompli Vineyard, we grow Cabernet Sauvignon, Cabernet Franc, Merlot, Malbec, Petit Verdot and Carmenère. We work all year to assure that all six varieties will mature at the same time, so they may be harvested together (not all grapes mature with the same sugar content). Conventional growers may tell you this cannot be done. With an open mind, however, and management efforts concentrated toward that end result, it most certainly can be done. In our Museum Vineyard, we have planted eight heritage clones of Cabernet Sauvignon and one clone each of Gros verdot and Cot (Malbec). Where Fait Accompli is a thoroughly modern spur pruned bi-lateral cordon vineyard with nine permanent wires, 110R drought tolerant rootstock and vertical shoot positioning canopy. Museum is much the opposite. Museum is an own rooted exercise in viticultural Darwinism with its spur pruned vertical cordons and “California Sprawl” canopy. Picking and co-fermenting all grape varieties together creates a flavor bond unlike anything that can be achieved through wine blending. This is not to say our method will necessarily produce wine superior to wine blending, but it does make wine that is decidedly different and, as fortune would have it, much to our customers' liking. The Real Winesmiths at Westbrook Wine Farm are the seriously finicky members of our Bunch Selection Committee. Each BSC individual can rightly claim to be a most important ingredient in our wine. “Just finished a 2008 Museum. Superb. Perfect balance of fruit, light tannins, well rounded, long finish, simply delightful. Per Anne, she finds it to have a mouth and taste bud satisfaction akin to very fine dark chocolate. And to quote her, "in my universe that is high praise indeed. I have had an article brewing in my head for a year . It would utilize like-kind data from my personal temperature sites up and down the coast (70+ of them now). My gut tells me my bottom line will be: much ado about a long-term trend that will have no short-term impacts. My early analysis indicates that if the scientist’s estimates of annual warming play out, in 30 to 40 years a regions “average” Degree Days per season will be similar to the 3 “warm” years they have actually experienced over the last 10 (1997-2007). Hardly a varietal-changing movement, unless you have the wrong varieties already (on the warm side). If the math works out that way, planting next year on the Humboldt Coast in anticipation is a bit over reacting. Yes I did receive your monitor. I downloaded it yesterday, worked the math magic and will be mailing out today summaries of ’06 and ’07, including the graph of their build up over the season. Your 5 year trend line has been cooler. I think that proves a Global Cooling is under way!! While every release of Fait Accompli shares the common thread of using the same six red Bordeaux varieties from our estate vineyard at Westbrook Wine Farm, there will always be vintage differences. A growing season may be longer or shorter, warmer or cooler. Rainfall plays a part and vines, like people, develop their individual expressions with age. Each variety does not necessarily yield the same proportion to the field blend every year. We celebrate the natural and intentional vintage differences by not blending wines into similarity but by co-fermenting the mix of grapes mother nature gives us. This is why we say that our Fait Accompli is truly "made in the vineyard". The decision as to when to bottle is made with great consideration for each wine's distinct personality and promise. "Esterification" in the bottle completes the wine's development process, rewarding its owner for each year it is properly cellared. Our two-inch top quality corks and 400 degree sealing wax dip further ensure this opportunity. It is, of course, up to the consumer as to when they "Crack the Wax". "The great vintages of Bordeaux have always been characterized by growing seasons that have been abnormally hot, dry, and sunny." "Poor years result from inadequate supplies of these precious natural commodities." — Robert M. Parker, Bordeaux, a comprehensive guide, Simon and Schuster 1998. 2010 is looking to be the wettest year since 1996 when it rained through June. Pruning was completed in our Fait Accompli and Museum vineyards in February and March. 2009 showed the effects of the 2008 frost damage in the dead cordon wood and small, short yet larger number of canes. There were no real surprises this year. The crop was nearly normal in size and exhibited a very pleasant and abnormally intense array of aromas during fermentation. Pruning in the winter of 2010 was more like surgery than like sculpting. Such is farming in these mountains. 2008 was our tenth vintage and it has the distinction of being the most surprising vintage to date at Westbrook Wine Farm. The surprise was not a good one. On April 20th a lingering 27 degree cold front descended upon us and many other growing areas in California. The primary shoot kill was nearly 100%. Fortunately we had not yet shoot thinned the secondaries and were able to depend upon them for a small crop. Of course, with such a top kill one must then contend with a seemingly never ending sucker population. A lot of chlorophyll under the fingernails this year. Average rain fall and no real oppressive heat nursed the small caliper canes along to a final yield of about one third our norm. The acidity, pH and color of the smaller bunches and berries have heightened our optimism about our three barrels of 2008 Fait Accompli “CRYO”. 2007 was a temperate year in contrast to the variables of 2006. Rainfall was about average at 20+ inches In O'Neals. What we can say is that that the wines are fleshy and fruit forward. 2007 may well be the best vintage for red wines we have seen to date. Look for them circa May 2010! Bottled March 18, 2010 after 30 months in barrel. This vintage of Fait Accompli “Renaissance” has met all expectations. 2006 Fifty inches of rain and April's snows gave way to a bright and comfortable spring which hastily yielded to a warmish summer with the hottest July in 138 years. Our mountain grown vines slowed their development until September's mid-nineties temperatures coaxed the fruit to Brix readings which ranged from 23.5 to 26.5 degrees. A protracted harvest from September 11th through the 14th gave us a ripe and well balanced field blend about 25% smaller than 2005. In fermentation, Fait Accompli has never looked or smelled better. On the lighter side, our Viognier-Valdiguie and Rosato Romantico have a cheeky new cellar mate from the soon to be famous Kenwara Vineyard in Madera. We're calling it "Uber Rhenish" Dry Riesling. You'll call it "delicious". Our mainstay Peterson Family and newcomer, Sturm Gardner Cabernet Sauvignons are hanging a little longer than last year promising an even greater concentration of flavors. As usual, the uncommonly flavorful Petite Sirah from John Simpson's two rows will be the last to come in. 2005 marks the third straight year of 'abnormally hot, dry and sunny' climatic conditions at Westbrook Wine Farm. Where our historical average of heat summations (degree days)is 3500, we are again approaching 4,000 plus. It is a time to remember the lessons from years past and farm the vintage as well as the vineyard. Over forty-five inches of rain has fallen through June which is about double our annual average of twenty-seven inches. The Fait Accompli vines have, of course, responded as though they are to receive like precipitation for the remainder of the year. Over 27 days of ninety-nine plus degree temperatures,shoot and bunch thinning and strict irrigation management have gently triggered the hormones necessary to begin the veraison ripening cycle. There has been no signs of mildew nor raisining and there is a true sense of wellness through out the vineyard. An added plus this year were the heroic efforts of over five- hundred fire fighters who contained July's "Quartz Mountain Fire" within a mile and a half of our winery and vineyard with no loss of life or dwellings. There is no way we can say "Thank you" sufficiently for their professional dedication and execution. 2004 started with a benevolent winter and a warm spring, which disallowed the degree of vine dormancy we prefer to see for proper fruit set and maturation. Shoot and bunch thinning, along with judicious irrigation, helped bring the vines into balance. At Westbrook Wine Farm we know the importance of "farming the vintage, not just the vines". Although we did not experience the hellish temperatures which beset us and other vineyards worldwide in 2003, vine physiology was still compensating and correcting itself. With this experience we will continue to be mindful of a previous year environment's effect on subsequent vintages. 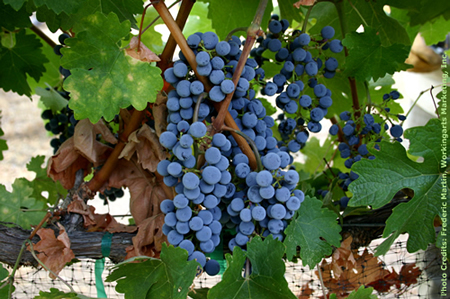 Many California growers, including our off-site suppliers of Cabernet Sauvignon , Valdiguie and Viognier, harvested up to a month earlier than usual. Our estate grown Fait Accompli field blend was harvested on September 19, which provided the longest "hang time" in our history. The sugars at the fermenter were 24.5° Brix and the color is typically dark. After a 48-hour cold soak, the 80°F fermentation lasted 14 days. As freshly fermented wine, it is now displaying aromas of black cherries (Cabernet), black plums (Malbec), and a heady floral perfume from a recalcitrant Cabernet Franc. We like it, to say the least. There is always a sigh of relief when the pressing to barrel is complete and the wines can begin their maturation/esterification process. Whew! 2003 was a record warm year for just about all the wine growing regions of the world. Even Germany and England were able to ripen fruit! At Westbrook Wine Farm, we recorded over 22 days of summer temperatures over 105° F. Our seven year old vines actually slowed or shut down the ripening process during the hours of excessive heat. There were two "gratuitous" rain events in June and July. We harvested our field blend at a mature 24.2° brix (at the crusher) on September 14th (Chateau Haut Brion began their harvest on August 30th). There was no vine heat stress and surprisingly little raisining, considering our VSP trellis format. A milestone, we were rewarded for the year's effort with nearly two tons of ripe, plumy fruit with a color exceeding even that of our 1999 vintage. We are finding it difficult to keep the glass "wine thief" out of the new French/American hybrid barrels where this 2003 Fait Accompli now rests. 2002 saw a light dusting of snow and over two weeks at less than thirty degrees before temperate weather settled in for the duration ... The fruit was unequivocally the most perfect yet and read 24 degrees Brix at the crusher. This marks our first " Grown, Produced and Bottled by " FAIT ACCOMPLI. 2001 began with pruning that started in January and completed in March. In order to promote all varieties to ripen at the same time, we prune the later ripening varieties first and then move through the vineyard accordingly. April rainfall caused the root systems to flourish and the buds to burst until back to back frosts cryogenically pruned the new shoots further. May saw temperatures escalate weekly from 75° to 95° F and the vines pushed through with a vengeance. We were challenged to complete shoot thinning and cane positioning before the growth became unmanageable. Over the next months, we pulled leaves and thinned bunches to assure a quality crop of ripe fruit for harvest in September. 2000 was a year of extremes. Three days of Winter snow contrasted with over 17 days of over 100 degree Summer temperatures. We experienced some raisining which was deftly remedied by our Bunch Selection Committee before crushing. This year we learned that our mountain grown vines are very resilient but that more foliage needed to be left on the south side of our east - west rows. 1999 gave us no appreciable rainfall after February. The vines naturally shut down their vegetative cycle early and we were blessed with a long moderate Summer and Fall. This enabled the vines' reproductive cycle and gave additional "hang time" for flavor development. Leaf pulling, shoot and bunch thinning, were performed by hand to further enhance flavors and color. Carmenere, the Missing Link? Historically, Carmenere has been difficult to grow in cold, humid climates, and its presence has greatly diminished in France's Bordeaux region. Thus, we felt the relative warmth of our Region III area and our well-drained granitic soils would be an excellent environment for growing this ancient Bordeaux variety. The virtual rescue and revival of this cultivar is the result of a twelve-year quest by Karen Melander-Magoon, co-proprietor of the Guenoc and Langtry Estates in Lake County. Originally grown in the Medoc, Carmenere was prized for both its depth of color and flavor (in a ripe year). It is thought to also be the antecedent of other better-known varietals. We are eternally grateful to Karen and Guenoc, as well as Chris Lindelof of Grey Creek Viticultural Services in Geyserville for favoring us with the Melander-Guenoc clone of Carmenere budwood for this "missing link."